The Original 5 Napkin Burger is one of the best burgers in town. Period. You don’t agree with me? Then bring it on...there’s nothing I like more than discussing what’s the best burger in town. With my friend Kelly we can argue for hours about it. We are opinionated people, and this is especially true on the subject of burgers. We have researched long and hard to find the best burger in town. Some we love, some we like and some we don’t care at all. Burger Joint at Le Meridien, Corner Bistro, Dram Shop, Black Iron, Burger & Barrel, Bill’s Burger, Shake Shack, are some of our fave. I first discovered the 5 Napkin Burger almost 6 years when I was still living in Hell’s Kitchen. On a lazy September Sunday night, I was walking down 9th Avenue when I first noticed the 5 Napkin restaurant. I walked in, got a place at the counter and ordered the signature burger without having a clue about it. It was love at first sight — more like at first bite. From that moment on, the 5 Napkin Burger has been in in my life. 10 oz fresh ground chuck, Gruyere cheese, caramelized onions and rosemary aioli on a soft white roll. The burger is near perfect. The meat is ground fresh, the doneness is always exactly done to my liking, and the rosemary aioli and onions complement the beef without overpowering it. I love the Original 5 Napkin so much today I’ve decided to create a meatball version of it. Basically all of the flavors of the burger, minus the bun, and bite-sized. ...and Gruyere cheese mixed with the ground meat. A couple of other ingredients and BAM! Meatballs. Rosemary aioli on the side. Cook and BOOM! 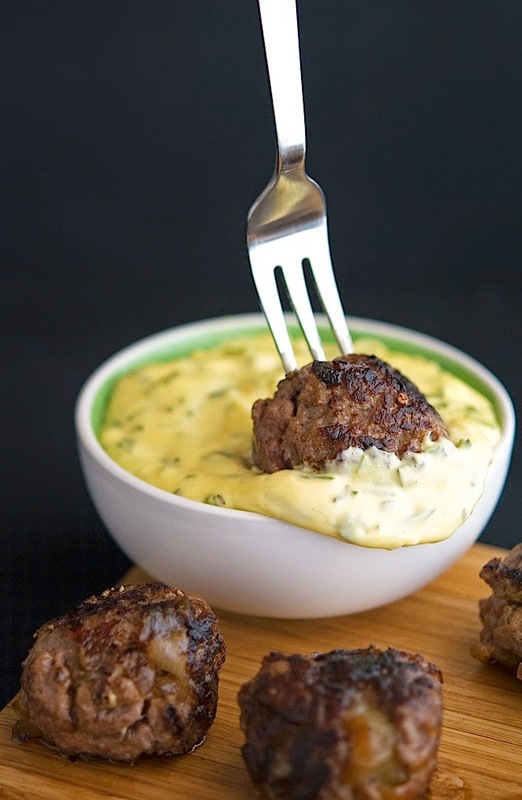 Dunk the meatballs in the aioli. Now that’s a sight for sore eyes! 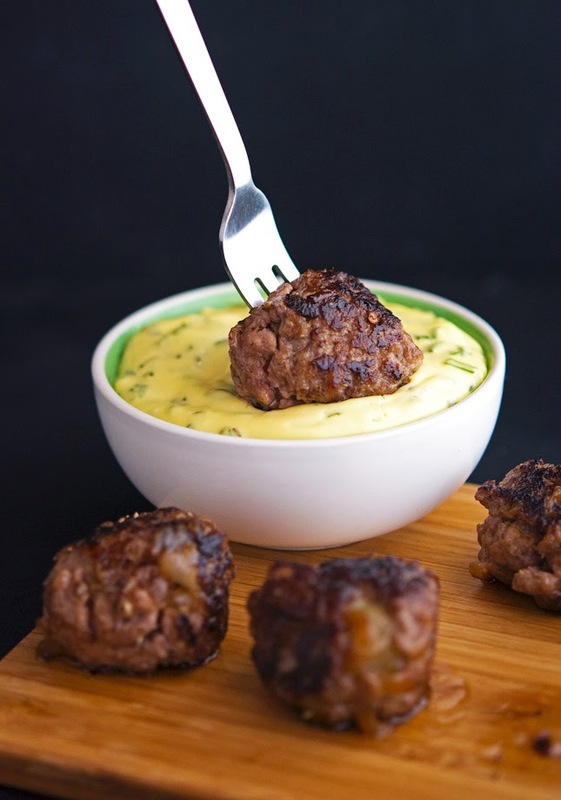 5 Napkin Meatballs with Rosemary Aioli Print this recipe! 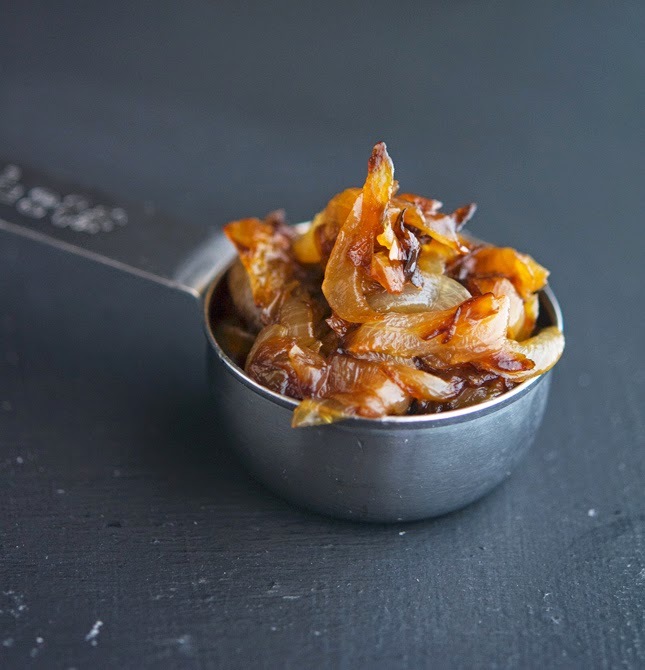 To make caramelized onions, heat 2 tablespoons of olive oil in a large skillet over low heat. Add onion and 1 teaspoon of salt and cook, stirring every now and then, until onions are soft and golden brown, about 40 minutes. In a bowl combine Gruyere, egg, caramelized onions, 1 teaspoon salt, and 1 teaspoon pepper. Add beef and almond meal (or GF breadcrumbs) and mix gently. With dampened hands form into 20 balls. Heat the remaining tablespoon of olive oil in a large (preferably non-stick) skillet, over medium heat. Add meatballs, and cook, turning gently, until browned on all sides and cooked through, about 18 to 20 minutes. Coarsely chop garlic, and gather into a pile; sprinkle with a pinch of salt. Place flat side of knife blade on top of garlic, with sharp side of blade away from you; press down firmly while pulling knife toward you to create a paste. Holding rosemary sprigs at their top, slide your fingers down it, to the bottom, to strip off the needles and finely chop them. Whisk mayo, garlic, rosemary and lemon in small bowl to blend. 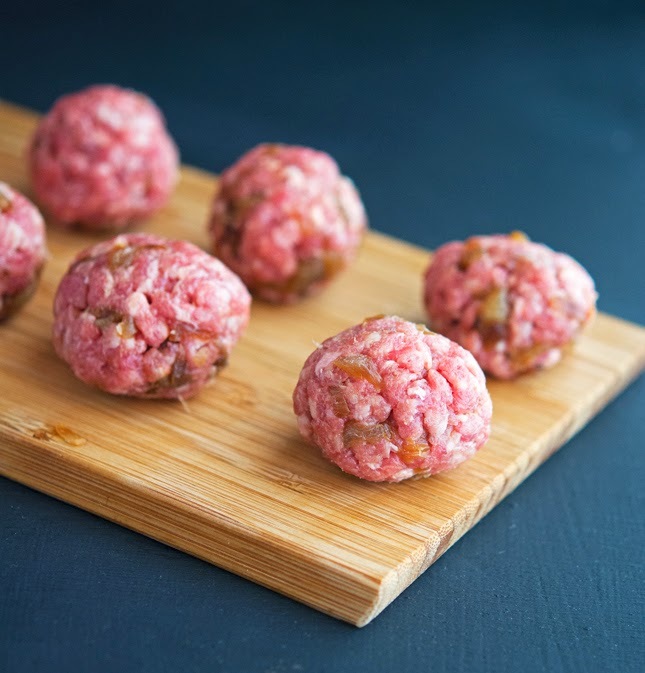 One meatball without aioli yields 83 calories, 6 grams of fat, 1 gram of carbs and 5 grams of protein. 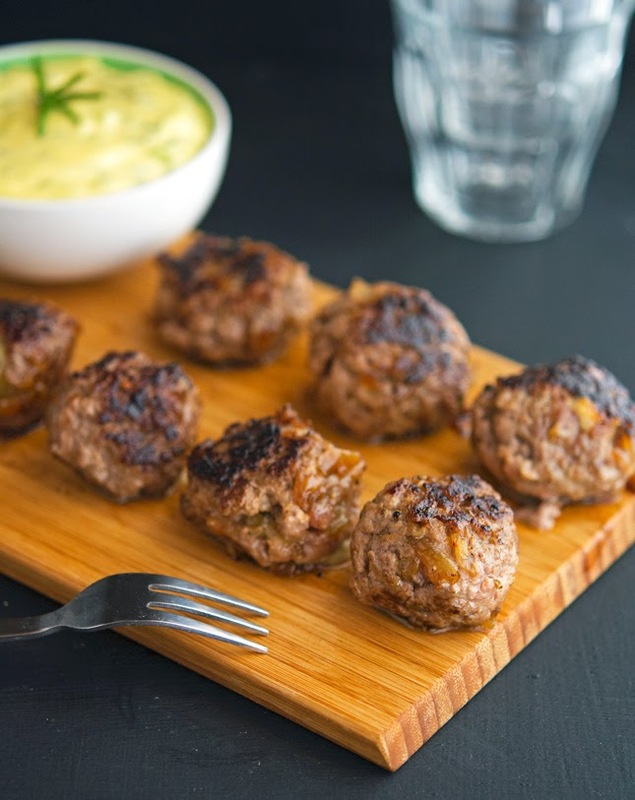 One meatball served with one teaspoon of rosemary aioli yields 108 calories, 8 grams of fat, 2 grams of carbs and 5 grams of protein. They look delicious. Hubby loves traditional meatballs, but we don't make them often anymore because I cannot have tomatoes. This would be perfect!! Thanks Mike, dinner is planned!!! Thank you Lauren, you're always so kind! Yummy! Love the sound of these the rosemary aioli sounds awesome too! The rosemary aioli is da bomb...seriously! Gorgeous pictures Mike and another great recipe. Thanks for sharing! Mike, ridiculously great flavoring in these. So easy to make and your pics, amazing as always. On our to-make list. Thanks man, you're always super nice! The best burger is one argument I know I will loose as (this might be hard to believe, but) I've never had a burger - I think I've had steak once and it was covered with cumin, coriander, chili and garam masala and I have had meatballs a friend made and on occasion beef curry my mom made - but - nope never a burger - though one with caramelized onions does sound pretty darn appealing! Thanks a million Shashi, coming from you it means a lot! Wow...Mike! That first picture belongs in an art gallery somewhere. Not to mention the fact that these meatballs sound absolutely amazing. I love a good burger...it's probably my #1 comfort food. Hearing about your burger exploits makes me wish I lived closer to the City. There's nothing quite like a juicy burger, to me it's one of the best things ever. And thank you for all the compliments on my pictures, I really appreciate them! O.M.G., that was some pretty bad typo, thank you so much for spotting it. I owe you big time! The pictures are breathtaking and those meatballs to die for! Mike, I have no idea about the restaurant responsible for the original of this; I'm sure it's nowhere near where I live. Fortunately for us, you have recreated the recipe. It sounds wonderful, and I'm looking forward to trying it. There are three locations in NYC, one in Boston and one in Miami...maybe one it's near to where you live? Mike you've done it again! Another recipe I must try! Keep up the good work. and Thank you! Thanks so much Bonnie, that's awesome! Hi Mike, I don't eat much meat but I have been craving a hamburger something terrible. These look wonderful. Pinned! A lovely recipe! I love the sound of that mayo! 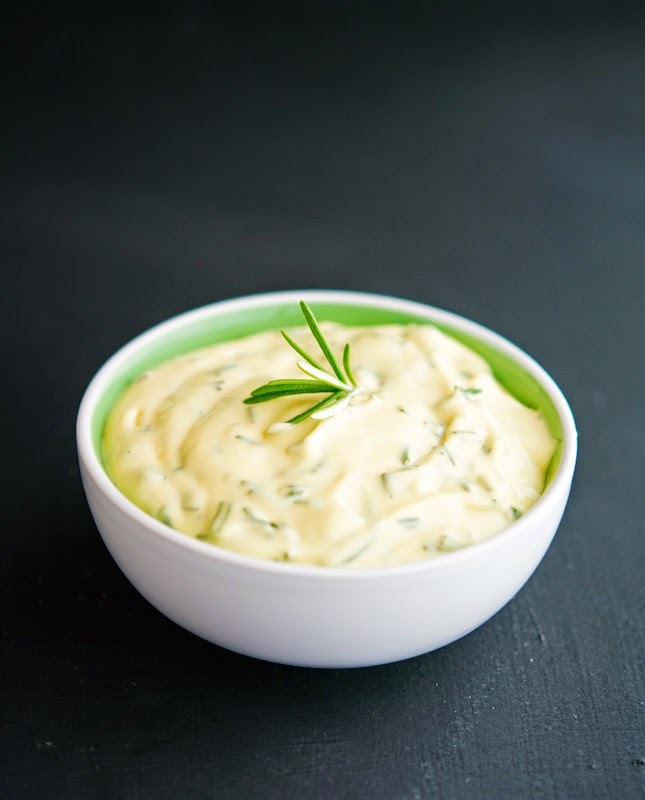 The rosemary aioli is REALLY GOOD, you should totally try it! Aioli makes everything taste great, I can make a whole meal out of it! I was salivating at your burger description - caramelized onions + rosemary = doesn't get any better! Aioli is the best. We have to give it to the French, they know how to make everything taste better (even mayo). And yes, the 5 Napkin Burger is really, really good! I love a good burger and although there are some good tasty ones out there, I'm not sure if I have ever found "the one". The 5 napkin burgers sounds amazing!! I love making aiolis and a rosemary one sounds so good. I also love the addition of caramelized onions. I'm not sure whether I want to make meatballs or burgers out of this, but I will be making it soon! Oh goodness... I'm not usually a fan of meatballs, but these... oh my... they look so dense and tasty and satisfying. And seriously, caramelized onions built right in? I'm a fan. These were amazing! Thanks for the recipe...it is definitely my go-to recipe for (real) meatballs. Now to try your lentil "meatballs!" I'm so glad you liked 'em that much, they're among my fave meatballs too! These are simply sublime. Perfection! I avoid nightshades and I was looking for an alternative to the standard italian or Swedish. These are a must make!!!! Love the aioli too. Wow. what is the difference between ground beef and chuck? and can i substitute beef for these? Yummaaay! Enjoying leftovers of this from last night for my dindins at work tonight. So good thanks for sharing dude! Makes being at work not so bad hehe. I'm so happy you enjoyed this recipe so much. It's one of my fave as well! Have you tried baking these instead of cooking on stovetop? Any ideas on how long to cook them? I think baking would be less labor intensive as I hate doing last minute cooking when I'm hosting a party! They sound fabulous!! I followed the link to the genius mayo! I have been trying to make mayo for some time ... nothing worked! This was magic! It was so fast, I was like: its already over? Perfect mayo!!! And thank you for your blog. I LOVE your recipes! Hey Mike! I am so happy I found your blog - all the way from Sweden. :) I made the 5 Napkin Meatballs with the rosemary aioli for me and my 13-year-old son the other night and we both loved it. I served it with oven roasted cauliflower. I still haven't found one recipe that doesn't sound delicious so there will be a lot of new dishes for me and my kids from now on. Thank you for all your inspiration! I eat a mostly Paleo diet. My husband is the complete opposite- his diet is mostly processed foods with zero fruits and veggies. Finding meals for us to both enjoy (and feel good about) can be difficult. I just want to say thanks for knocking it out of the park with this recipe, and every other one I've tried! I've made 4-5 recipes from this site, including these meatballs tonight. My husband has loved every single one! He even said "next time, you should make more for me!" This recipe is over the top delicious. I've made these meatballs and aoili numerous times since I discovered it and that was only a few months ago! We have made them as burgers too. Big hit!! I just found these on Pinterest and they are amazing! Best meatballs I've ever made. I think it was the caramelized onions. I've just started making my own aioli and never thought of adding rosemary. Thanks for the great recipe - I've been doing Paleo for 2 years and am always on the lookout for new ideas. Love 5 Napkin Burger Original. This looks delish. Wondering if I could bake/roast meatballs in oven instead of stovetop? You can bake them like you would regularly...if you're familiar with that process. They just might not have the same crispy taste as they would if you pan fried them. That's how I cooked mine. It's been so long that I don't remember the details, but they turned out great! Just google baked meatballs and you'll be good to go. We make these almost every week! So freaking amazing. What is a side dish you would suggest serving with these though? We don't want to it to be too heavy with a starch...suggestions? Thanks! Made these as sliders for dinner tonight, with the aioli. Family inhaled them! Soooooo goooooood! Another winner, Mike! These meatballs melt in your mouth. The caramelized onion flavor addition is amazing. Yummm! !